Here you will find a reflection on various aspects of our voyage through time, space, memory and the pile-ups. I hope the reader will accept my apologies for not sticking to purely HAM subjects and venturing into certain areas of that enigmatic island that are well hidden from the casual look. 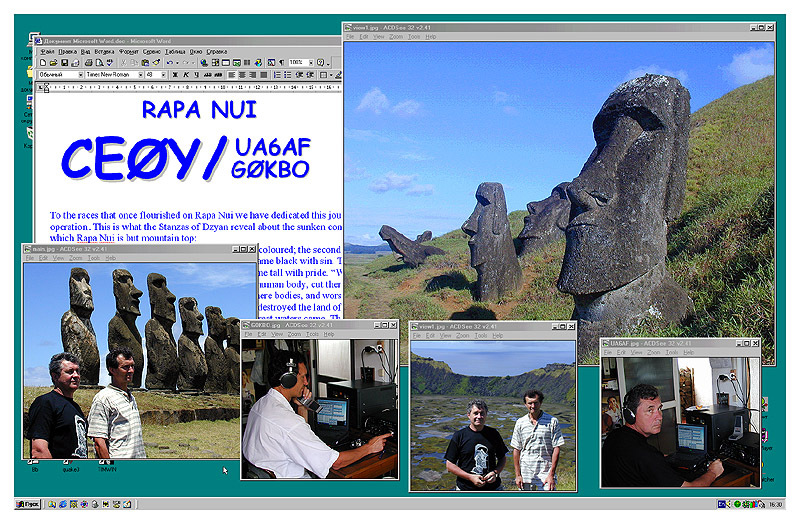 These may have little to do with amateur radio, but much to do with our trip. 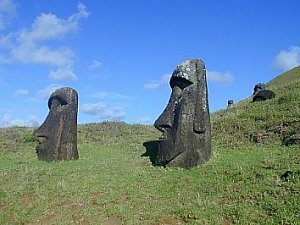 Though Victor shares with me some ideas about the island's history, the following account is my own. 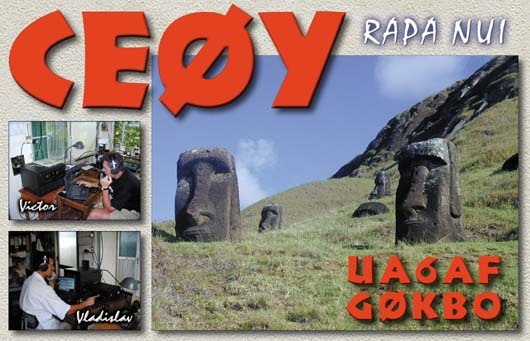 Ours was a "DX-pedition" with a difference, as will be explained below. 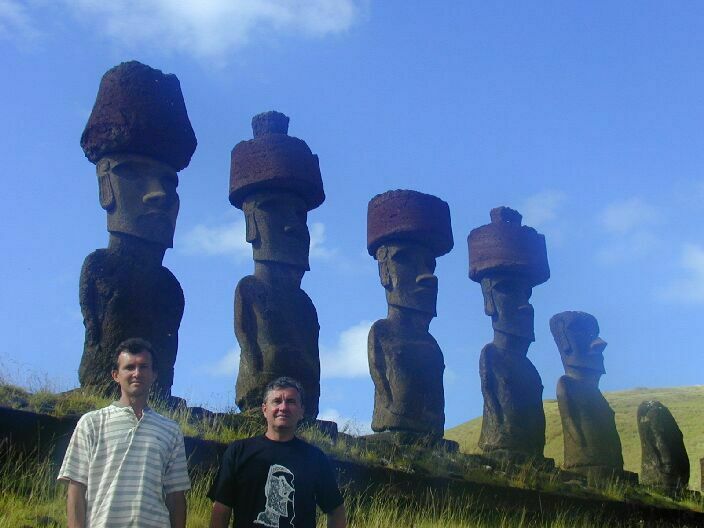 This was in effect our pilgrimage to the past, paying homage to the ancient home of the human race. 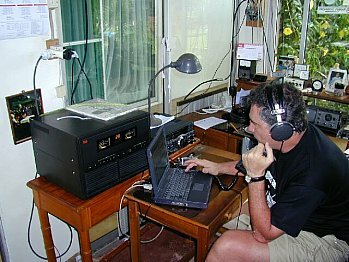 Amateur Radio played a big part in it too and was not unlike Speaker's Corner in Hyde Park in its effect. Many HAMs have visited the island and many more will do so in the future for different reasons, driven there by various ideas, desires and hopes. Our little expedition was just one of a multitude of similar ones: a quest for knowledge, and an urge to share what we found with others. Both of us have been fascinated by the enigma of Easter Island from an early age, having come across Thor Heyerdahl-s book. We became involved with amateur radio in the 1960s. Victor has been on the air ever since, achieving in his time most of the usual honours a HAM would wish. He is a great CW and IOTA enthusiast. In my case radio has not constituted my main hobby, but I have always been keen to return to it whenever circumstances permitted. Unveiling the mysteries of the past is my true hobby. After entertaining the idea of visiting the place of our early dreams, we eventually got things together during 1999 and chose Easter of 2000 as a possible symbolic time to go. In the end, we brought the date forward to February-March. 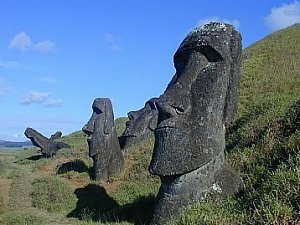 And there we were, flying from Russia and the UK respectively to that far away land of ancient mysteries. 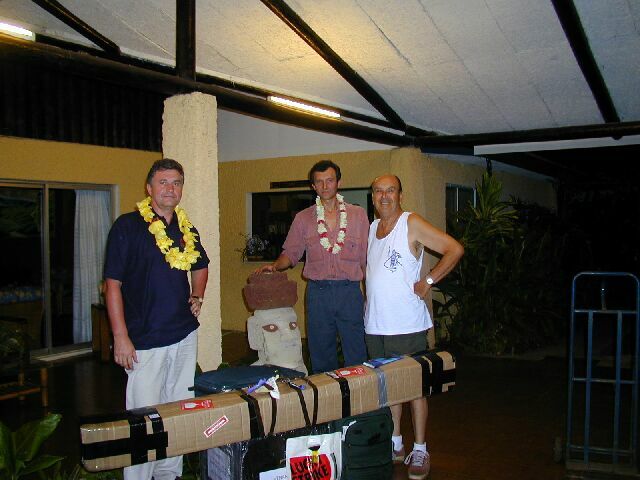 We deliberately kept a low profile, announcing our operation just before departure from Santiago for the island itself. 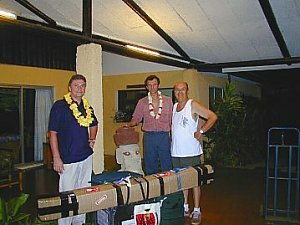 No sponsorship was sought by us, only advice from other HAMs on freight, antennas etc. There are many HAMs with a similar attitude and we are glad to see that their number is ever increasing. The only drawback of our approach was that with no advance announcement there was a good chance of "overcrowding" a particular QTH. This was precisely the result in our case. 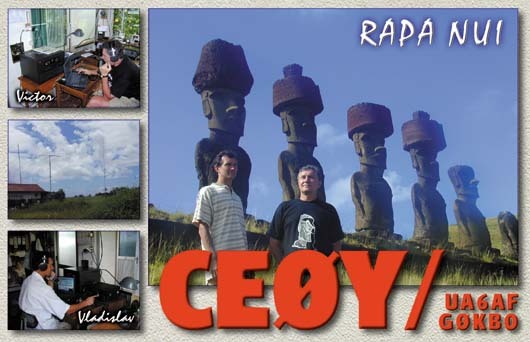 A fellow amateur's (ON5AX) trip to Rapa Nui coincided with ours and for a couple of days there were more than enough CE0Ys on the bands. However, my view was then, and it is now, that the more stations operate from such locations, the better it is for our hobby, since more HAMs have a chance to work that particular country. Here I would like to reflect on the pile-ups. Since my presence on the air is not frequent, the experience of being a DX for somebody was a new one. 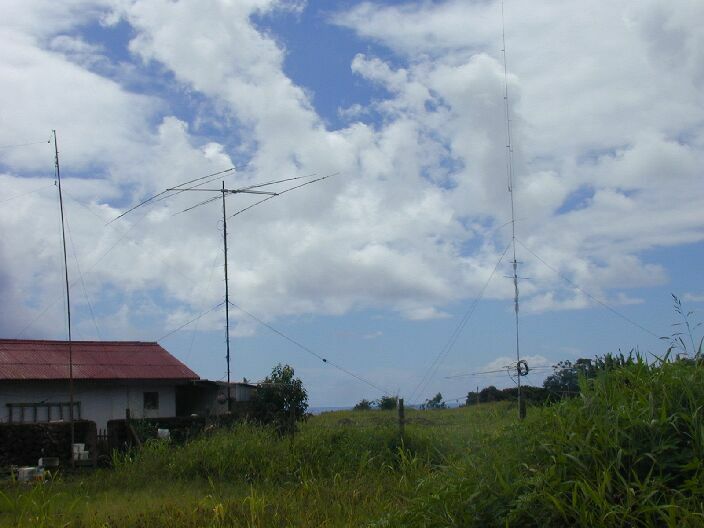 Coming from the UK where the majority of HAMs have neither good antennas nor linears, and from Russia (with a similar situation), we in vain sought an answer to the ever present question v how to work those HAMs who are using "bare foot" plus a dipole? It is on amateurs like these that our hobby hinges, in my view. Normally they have little interest (for the possibility of success is limited) in joining the pile-ups. Unless the DX has at his disposal a pair of good ears with a lot of patience and experience, these HAMs have little chance. At times I tried to experiment, asking those who are pretty certain that their signal can be easily heard on Pluto to reduce their power a little, so that the impenetrable (+20 db) wall of noise be reduced. Breaking the pile-up by numbers helped a little, enabling us to work some QRPs, only to the frustration of those who had no time to wait for their turn. 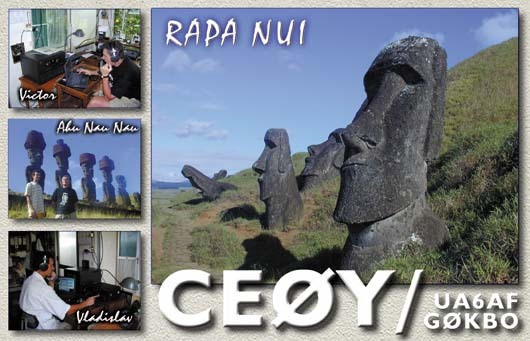 CW provides some answer in this respect and Victor managed to reach a speed of 7 QSOs per minute on our last day. A lot of HAMs knew Victor as a fine CW operator, but this expedition gave him a real opportunity to put all his skills to the test. 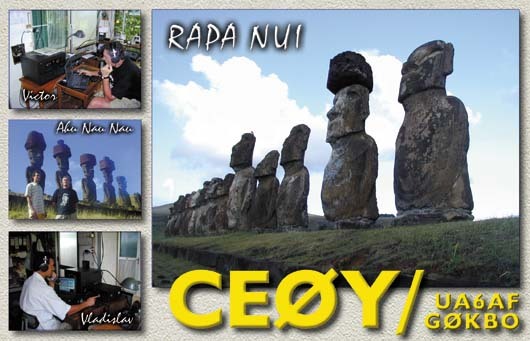 All direct QSLs to both of us are handled by myself (G0KBO). E-mail requests/bureau are OK too. 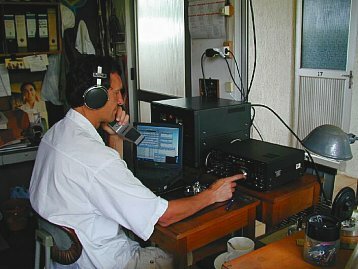 Amateur Radio was the means to our end, because it is one of the best instruments around at the moment to unite the dysfunctional human family, whether used consciously or not. It symbolizes and ever searches for understanding, a common language and better means of communication, serving all humanity. If for the sake of achieving that sense of unity one has to travel these great distances - so be it. The greater the distance to the nearest human habitation, the greater the realization of unity. This was our experience and a similar sense prevailed at the other end of the pile-up. 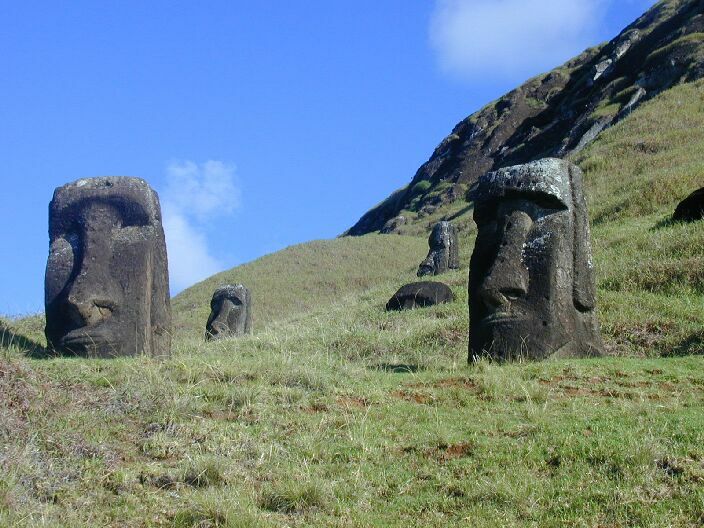 If Easter island is nothing else but a symbol of the intrinsic common roots of all the races upon the planet, then our hobby is a symbol of the common language belonging to the same. From common source to common goal humans will march, and if Amateur Radio helps even a tiny bit in this march, it gives any HAM an immense sense of privilege and opportunity to be part of that. На русском языке: ��������� ������� ����� � 2000 ���� - ��������� ���������; На английском языке: kohau-rongorongo, Easter island script.